Before you dismiss this B title, give me a chance to persuade you while this might be worth your wile. Since I do think it is. Let's get this straight. This movie is cheesy to the bone. But it works since everyone in this film take the events seriously but never too seriously. There is enough comic relief to stop you from swearing about what is unfolding in front of your eyes. And that is all because of Steven Williams. He steals every scene he is in and gives everything that lightness that is very needed without going over the top in silliness. 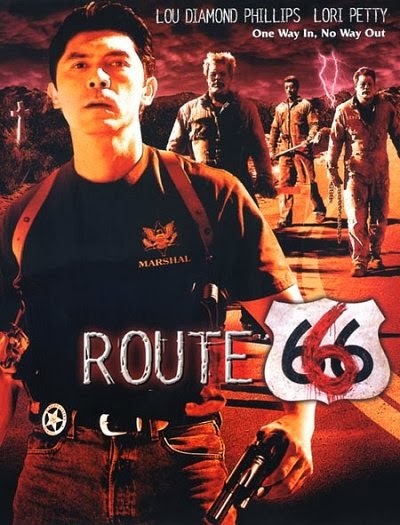 Route 666 actually manages to hold your interest because it it does try to be original and creative. I says it tries because for the most part there is nothing you have not seen before. Although the supernatural element in this one was a delightful one. And makes it entertaining from the minute that gets that into gear. Does it matter that some actors don't fit their roles. No, in B movies that is almost a plus. So give it a shot. Best enjoyed in company of friends and if you are in the mood for some silliness only B movies can provide and thank god for that.